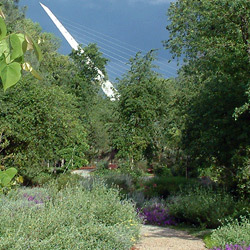 The unique location of the McConnell Arboretum & Botanical Gardens sets it apart from other public gardens – with a magnificent view of Shasta Bally Mountain to the west, the impressive tower of the Sundial Bridge at Turtle Bay to the east, and the riparian environment along the banks of the Sacramento River, with natural valley oaks and native vegetation. The design of the pathways, garden spaces, plant collections, and the integration of nature-based and nature-inspired original art build upon the beauty of the natural environment. Mediterranean Climate Gardens – All five of the world’s mediterranean climate zones are concentrated within the latitudes of 30° and 45°, a little less than halfway from the equator to the poles. These zones include the Mediterranean Basin, South Africa, Chile, southern and western Australia, and California west of the Sierra Nevada. Plants native to all of these areas thrive in the new Gardens. Redding’s own mediterranean-climate zone is well suited to this diversity of plant life. Each of the mediterranean climates is represented in the Gardens featuring unique plants in a Chilean Garden, Mediterranean Basin Garden, South African Garden, Australian Garden, and California Garden. 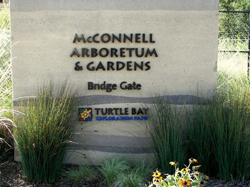 Bridge Gate (East Garden Entrance) – The main entrance to the Gardens is just to the west of the Sundial Bridge at Turtle Bay on the north side of the Sacramento River. The Bridge Gate entrance is preceded by a public area known as the Quarry Patio Garden, a gathering place with tables with umbrellas, food and beverage kiosks, public restrooms, and a staging area for entertainment and programming. Perennial Companions Display Garden – Companion planting is a way of looking at plants, not separately, but in association with the other plants around them. This planting method has been used for thousands of years around the world. California Garden – As you enter the Gardens, the California Garden is the first of five mediterranean-climate zone gardens and includes species that thrive and survive in this part of the state. Here, water-wise methods such as planning a water-saving design, choosing appropriate plants, and using proper irrigation techniques are demonstrated. Shasta County native plants are highlighted. South African Garden – The cape of South Africa has a mediterranean-climate that supports many colorful plant species. Many commonly grown geophytes (bulbs, tubers, etc. ), such as gladiolus, come from this region. Pacific Rim Garden – The Pacific Rim Garden features fascinating plants from countries around the Pacific Ocean that will grow in this region. Sounds of Water, a unique and beautiful water feature by ecological artist Betsy Damon provides a refreshing oasis as well as teaching visitors about water use in California and the types of plants associated with water conservation. Australian Garden – The large collection of trees, shrubs, perennials, and groundcovers from southern and western Australia represents a small portion of the mostly drought-tolerant plants that can grow in local gardens. Chilean Garden – The flora of Chile is not well known to the rest of the world. Central Chile has about 2,400 plant species compared with 4,400 species in California’s larger mediterranean-climate region. About half of the Chilean plant species are endemic, meaning that they grow nowhere else. Visitors will find special and unusual plants here that they can successfully grow in their native California gardens. Medicinal Garden – Ten small planting beds represent an abstract human body with head, arms, stomach, lungs, and other internal organs. Plants in the Medicinal Garden are representative of species used in traditional herbal cures. Some of these plants are also the basis of medicines and supplements used today. Mediterranean Basin Garden – The Mediterranean Basin encompasses portions of 15 countries in Southern Europe, North Africa, and the Middle East. Many plants in the Mediterranean Basin Garden are very familiar to gardeners. Several varieties of lavender, rosemary, rockrose, and yarrow, along with other little known species are included in this garden. Butterfly Garden – The Butterfly Garden contains both nectar and host plants for butterflies. Several species of butterflies visit the garden, particularly on warm days. Insecticides, even organic ones, are kept to a minimum throughout the gardens, in part to encourage butterflies and other beneficial insects to visit. 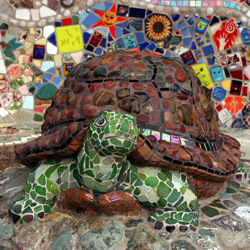 Children’s Garden – The Children’s Garden is home to Mosaic Oasis, a whimsical and fun water feature that includes a drinking fountain, ornamental fountain, and play structure designed by local mixed media artist Colleen Barry. The Children’s Garden and Picnic Grove areas are full of fun and interesting plants from around the world. Fitzpatrick Celebration Garden – Fitzpatrick Celebration Garden is designed with several garden “rooms” perfect for weddings, corporate events, parties, and receptions. Carl & Leah’s Meadow – Named for Carl & Leah McConnell, this meadow is a relaxing retreat of wildflowers or native grasses, depending on the season.